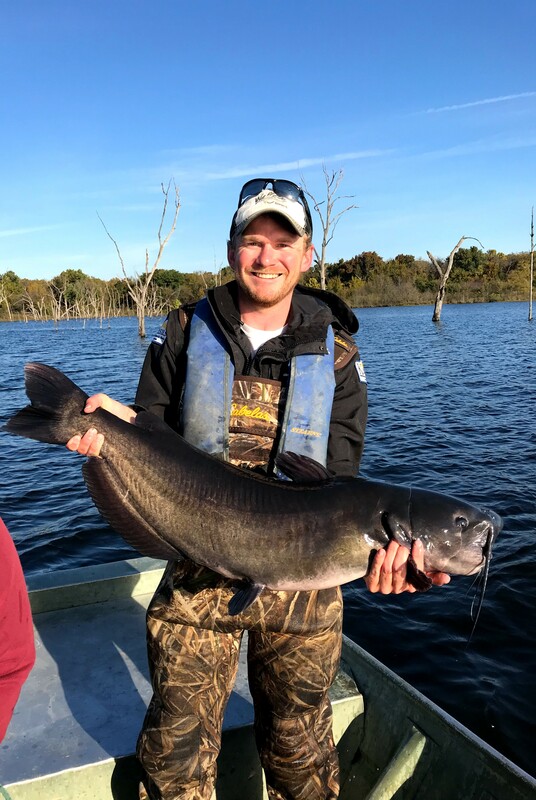 Connor Ossowski, a May 2016 fisheries and wildlife graduate, checked in with us to share how earning his degree at SNR helped prepare him for his career as a fisheries biologist with Kansas Department of Wildlife, Parks and Tourism. How do you feel your SNR education prepared you for your career? The education that I received through the School of Natural Resources was second to none. I owe a lot of gratitude to not only the coursework that I received, but the mentorship that was provided to me by my professors. From being taught how to calculate relative weights to assess condition of fish populations in Fisheries Science by Dr. Chris Chizinski, Dr. Marty Hamel in Stream and River Ecology teaching the River Continuum Concept, and identifying morphological traits that are unique to each species of fish in Ichthyology by Dr. Mark Pegg, the knowledge that I gained in my Fisheries & Wildlife coursework I put into action on a daily basis as a fisheries management biologist. I also had Dr. Mark Pegg as my academic advisor and that benefited me to be able to meet with him throughout my undergraduate career to mentor me to become the fish squeezer that I am today. What position do you currently hold? What do you most enjoy about it and what do you find most challenging? Kansas Department of Wildlife, Parks and Tourism District Fisheries Biologist. I enjoy being able to get outside and sample fish populations with the electrofishing surveys in the spring and setting nets in the fall. I'm incredibly lucky to be able to call this "work" and my "job", which certainly doesn't feel like work managing fish and to enhance fishing opportunities. The only challenging part of my job is managing the resource for the constituents to the best of my ability. Some lakes have better habitat for certain species, while others lack habitat and have an abundance of gizzard shad and common carp. Anglers love to catch walleye and crappie, myself included. Some lakes aren't as conducive as others in the state to have the numbers of walleye and crappie as others that can be found throughout Kansas. My goal is to increase habitat, conduct habitat restoration efforts, and to manage certain impoundments for species that will thrive to make fishing better in those bodies of water. Who were some of your favorite (or most memorable) professors and classes? The most memorable classes that I had at UNL was Fisheries Science with Dr. Chris Chizinski, Stream and River Ecology with Dr. Marty Hamel, and Ichthyology with Dr. Mark Pegg. Each of those classes had a chance to get out in the field and sample fish populations with a variety of gears that was extremely valuable to have a chance to gain experience as an undergraduate student. We also had an assignment in Fisheries Science that was a fisheries management plan where we assessed the fish populations and identified trends of each species using a multi-year dataset. I haven't been as excited as I was to spend as much time as I did on that assignment and put that experience to use on the same concepts of the management plan as a fisheries management biologist. Describe your post-SNR career path. Did you attend graduate school (when/where)? If so, what did you study and how did you determine your research interests? I graduated from the University of Nebraska-Lincoln in May of 2016 with my Bachelors of Science in Fisheries & Wildlife with a concentration in Fisheries Ecology and Management. I was able to stay on as a Fisheries Research Technician with the Dr. Pegg fisheries lab. I worked with graduate student, Stephen Siddons, on the Channel Catfish research project on the Red River of the North in Manitoba from May until September. From September through April, I continued to work on different fish research projects and standardized sampling efforts with Dr. Pegg's lab. I was able to gain a full-time position with Kansas Department of Wildlife, Parks and Tourism as an Fisheries Environmental Associate in the Emporia Research and Survey Office in April of 2017. In that position, I led statewide field sampling efforts for the Aquatic Nuisance Species (ANS) program for white perch, zebra mussels, and asian carp. In addition to the field sampling for ANS related work, I also conducted fish disease testing in private hatcheries, public waters, and public hatcheries. I was able to conduct research in Kansas identifying what variables interact to drive bluegill and redear sunfish growth throughout the state. In June of 2018, I gained the position of District Fisheries Biologist in Pittsburg, KS. My district includes Cherokee, Crawford, and Neosho counties that include previously mined strip pits located on the Mined Land Wildlife Area, two state fishing lakes, and various city and county lakes. I conduct fish sampling to monitor the fish populations, enhance and manage habitat for fish, and serve anglers to increase opportunity and make fishing better in southeast Kansas. When did your professional career begin to take shape? My professional career began to take shape my freshman year at UNL where I began volunteering my time with the Dr. Pegg fish lab and continued throughout my undergraduate experience. I spent my summers all four years of my undergraduate career as a seasonal fisheries aide in Kansas working with a District Fisheries Biologist at Glen Elder, which was extremely influential in my professional career. Describe your non-academic activities during your time at the university. For example, were you involved in any SNR-related student groups? Did you study abroad? I was involved in the Student Subunit of the American Fisheries Society. I gained a lot of insight and experience by interacting with graduate students and professors in the Dr. Pegg and Dr. Pope fisheries labs. I attended the Nebraska chapter of the American Fisheries Society meetings, as well as presenting research as part of my internship with KDWPT on blue catfish diet trends at the joint Nebraska and Kansas American Fisheries Society meeting. Would you change anything about or take anything back from your time at SNR? I wouldn't take anything back from my time at SNR. The one experience that I would change is to become more involved with the Wildlife Club, as they had a lot of memorable trips and meetings that I regret not being a part of. What advice would you give to current SNR students who aren’t sure or don’t feel confident about their postgraduate future? I would talk with Dr. Pegg, graduate students, and NGPC fisheries biologists about the opportunity gain experience in the field assisting with sampling efforts. I was never told no and that they didn't have room for me. I would advise current SNR students to not be afraid and take that first step to ask a biologist a question and to volunteer your time to gain experience in the field that you're interested in. I would also recommend gaining a variety of experience (wildlife, fisheries, conservation) with multiple biologists in different fields as the more opportunities you gain throughout your undergraduate career will pay dividends in your professional career in choosing a career path, especially if you're unsure of which route to take. Lastly, find your niche in your field and take advantage of each day of experience that you are provided with. Get involved early and gain as much experience as you can in your summers throughout your undergraduate career.